AMERICAN INDEPENDENCE DAY JULY 4th. Colonies regarded themselves as a new nation, the U S A! No longer part of the British Empire! Independent they are. And ceremonies! A day any nation worth celebrations! Here is a friendly Nation great wishing them a happy day! WORLD SPORT JOURNALIST DAY JULY 2nd. A great nation is celebrating its birthday today! The leader of the world! American President is a very strong man in the world! He influences the whole world economically and politically! 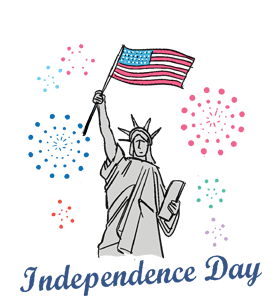 I wish all the people of USA a joyful Independence day!